Based on a real piezo-electric sensor, we consider this as the best low-cost equipment on the market for professional use in underwater acoustics. 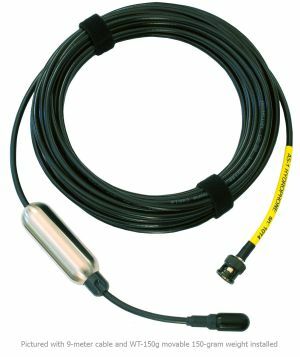 The Aquarian Scientific AS-1 is a high-performance hydrophone that offers exceptional versatility in a wide range of applications. The AS-1 can be used as a low power source for underwater signals. It can be delivered as a calibrated unit, with full calibration specifications. All calibrations are carried out in a third party U.S.Navy Lab. The Aquarian Hydrophone System is used in a diverse range of applications; each user's listening requirements are different. No headphones, amplifier or patch cables are included. Please do not overlook the importance of a good quality headset or amplifier/loudspeaker system to overall system performance. • Can be fitted with its optional PA4 dedicated preamp, that runs on standard 48V phantom power. The Aquarian system, for the AS-1 model, offers a low-noise external preamplifier named PA4. It is easy to integrate into virtually any recording or amplifier system. The preamp will drive cable lengths up to 30 meters with negligible signal degredation. NAUTA stocks part of the catalogue for next-day shipment within Europe. If we are not able to ship your order within two business days, we will contact you with an expected ship date prior to payment. If you require time-critical express shipment, please write us for verification. The AS-1 is designed to provide maximum sensitivity in a small size while also providing a linear response in the bandwidth of the highest-quality commercial digital sound recording interfaces. Response is omnidirectional in the human auditory bandwidth, as well as omnidirectional in the horizontal axis at all frequencies (theoretical). Given these qualities, the AS-1 is well-suited for absolute underwater sound measurements in marine and industrial environments. It can also be used as an omnidirectional reference projector. 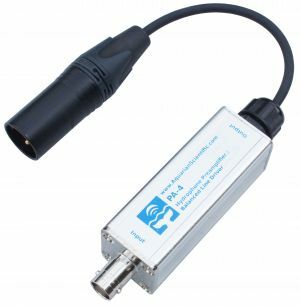 Use directly with your scope or DAQ device or use with the PA4 preamp and any digital recorder or sound interface for high-quality, low-cost underwater sound analysis. Fitted, breathable EVA case included with cable lengths of 20 meters or less (longer cable assemblies will not fit in case and will be bulk shipped in allowable packaging). Cable length: 9 meters standard. Any length on request. Phantom powered preamp for hydrophones.